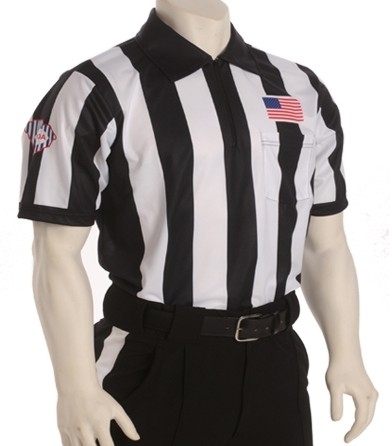 SCFOA Football Referee Shirt - Includes A Dye Sublimated SCFOA Logo Above The Pocket And A Gold Trim Sublimated USA Flag On Sleeve. Smitty Elite Material Is Smooth Like Silk And Very Breathable For Comfort. Extended Tail Helps Keep Your Shirt Tucked For A More Tailored Look.